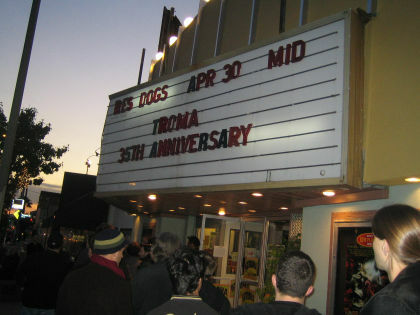 Photos From Troma’s Big 35th Anniversary Celebration At The New Beverly Cinema! 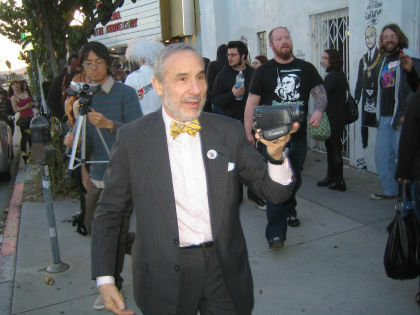 I had an absolute blast hanging out with Lloyd Kaufman, Toxie and all the Tromettes last night for Troma’s big 35th Anniversary celebration at the New Beverly Cinema here in Los Angeles where they were screening uncut versions of The Toxic Avenger and Poultrygeist! A big thanks to all of you who came out to show your support for truly independent cinema! 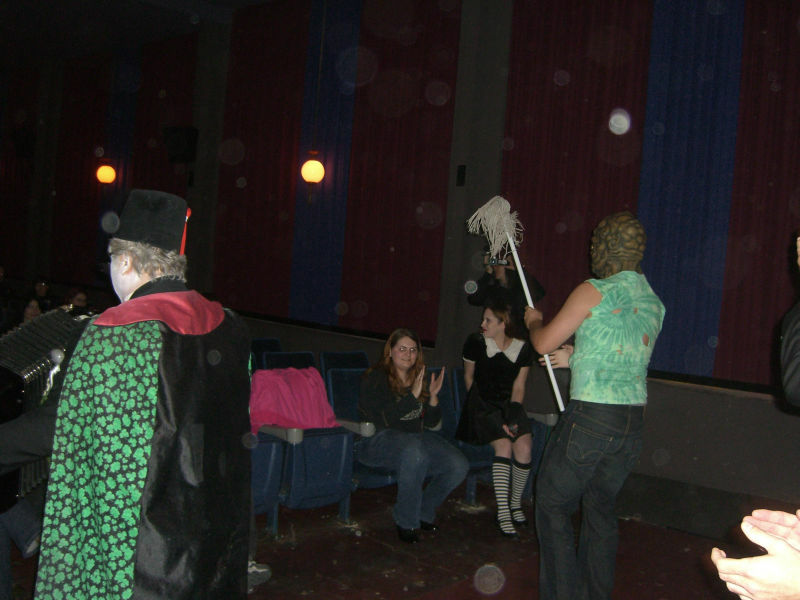 Lloyd Kaufman & Doc Mock Live At The New Beverly Cinema This Thursday Night! Doc Mock will be helping out Lloyd Kaufman for Troma’s 35th anniversary celebration at the New Beverly Cinema this Thursday, April 22nd starting at 7:30pm. 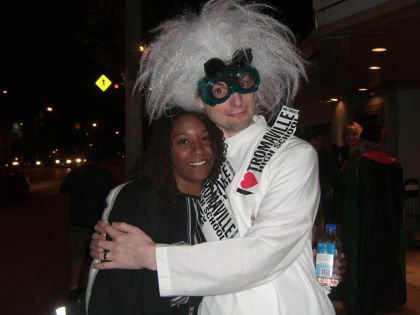 Lloyd will be screening The Toxic Avenger and Poultrygeist that night, and you’ll find Doc Mock at the Troma table. If you live in or near the Los Angeles area, please come stop by and say hey, buy some cool merch and watch two hilarious Troma flicks at my favorite theater for only 7 bux! Toxie will be on hand too! Don’t forget! Lloyd Kaufman is scheduled to appear LIVE on Doc Mock’s Movie Mausoleum on Thursday, June 24th at 8pm PST! Mark it down on your calendars, because that’s one show you won’t wanna miss! No Doc Mock Tonight, So Check Out These Awesome Videos From Our Fans! Sorry guys, but there’s no new show tonight. However, while we wait for the studio to get on more solid footing so we can resume a normal show schedule, take a look at these awesome Doc Mock’s Movie Mausoleum theme song video interpretations that some of our fans sent in! Hopefully it will inspire you to record some and send them to us so we can air them on a future episode! Amazing entries eh? Thanks again for sending them in guys! To those of you who haven’t, post links to your Doc Mock Youtube videos in this thread so we can check ‘em out and we’ll also air them on a future episode of the show! Episode 31 With Brian Huskey Now Online! Ever wonder what it would be like to land a devastating punch on somebody whose entire skeletal system was made of wobbly rubber? Sure you have! And that’s why you need to watch our latest episode from last week! Yes indeedy, Episode 31 of Doc Mock’s Movie Mausoleum is now permanently archived online for your viewing pleasure! Big thanks again to our special guest Brian Huskey for joining in all of the anti-hero awesomeness of episode thirty-one and then hanging out with everybody in the chat rooms during the post-show! As always, you can view any other archived episodes in Doc Mock’s channel on theStream. And don’t forget, all of our new episodes are now available for free download on iTunes! DON’T FORGET! We have an ongoing contest! Everybody always sends in nice compliments about the Doc Mock’s Movie Mausoleum theme song, so we decided to have you guys participate in the fun of it. Now is your chance to show us how YOU would perform the song if given the chance! All you need to do is upload a video of yourself singing and/or screaming along with the song to Youtube and then send us the link. Anybody who sends us an entry will have their music video played for the entire Doc Mock audience during a LIVE episode of the show! Click here for full details about the contest! 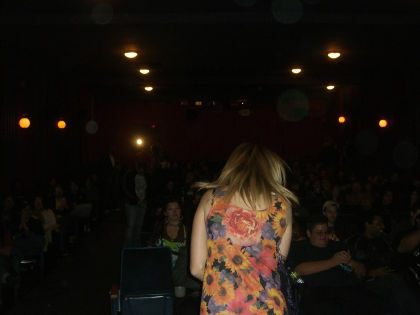 Stay tuned to DocMock.com for updates on when our next LIVE episode will be! 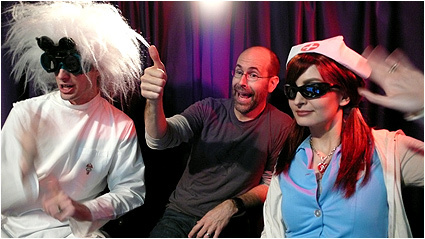 Brian Huskey LIVE This Thursday Night On Doc Mock @8pm PST / 11pm EST! Don’t forget, this Thursday night we have Brian Huskey (of Best Week Ever, Step Brothers, Superbad, Semi-Pro and more) as our special guest on Doc Mock’s Movie Mausoleum! The show starts LIVE THURSDAY night at 8pm PST / 11pm EST, so be sure to log in to the chat rooms early to talk with Miss Diagnosis and get ready for another fantastic guest along with a crazy flick from yesteryear! ENTER DOC’S VIDEO CONTEST! Everybody always sends in nice compliments about the Doc Mock’s Movie Mausoleum theme song, so we decided to have you guys participate in the fun of it. Now is your chance to show us how YOU would perform the song if given the chance! All you need to do is upload a video of yourself singing and/or screaming along with the song to Youtube and then send us the link. Our lucky winner will not only receive some Doc Mock prizes, but we’ll play your version of the song LIVE on an episode of the show! Click here for full details about the contest!